Music has played a key part in Carrs Lane’s long life, and continues to do so. The music for services and various other events is overseen by the Church Musician. 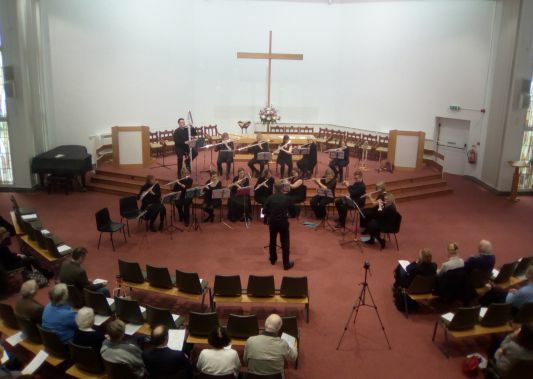 A small number of concerts and workshops are offered through the year, ranging from chamber music by two musicians, to whole symphony orchestras; from African drumming to dance. Have a look at the News section for further details. Hymn-singing is an important element of the worship. This is led by the mixed-ability choir most Sunday mornings (but not the third Sunday – see Singing Group, below). Usually on the first Sunday of each month, the choir sings an introit and anthem, drawing from their extensive repertoire spanning Renaissance motets to modern anthems. The choir rehearse on Friday evenings at 19:00-20:00, and on Sunday mornings (except on the third Sunday), 09:45-10:15. New singers are always welcome: contact the Church Musician via the church office for more information. 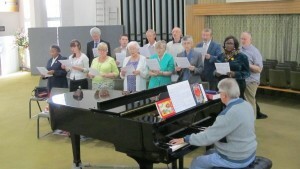 Two links with foreign congregations have developed through the choir. For over 30 years members have exchanged visits with a choir in south-western Germany; in recent years, a large group from the choir and congregation visited Germany in September 2011 and again in 2015. Reciprocally, members of the choir and congregation from Germany visited Birmingham in 2013 and again in late September 2017. We have also exchanged visits with a choir in South Africa. Only one half-hour rehearsal per month! Come and join us if you enjoy singing with a group (we are about 14 in number) – easy contemporary worship songs – singing in unison – no auditions – no need to be able to read music. Meet in church at 9.45am on the third Sunday of each month, to prepare items for the service which follows. Why not give us a try – no pressure to be committed for ever! Contact our Music Director Tim Batty via the church office if you need any more information, or just turn up on a third Sunday at 9.45 am. We are fortunate in possessing a very fine 3-manual pipe organ, built in 1970 by Hill, Norman & Beard, and incorporating some much earlier pipes from the previous church building. We have a Yamaha ‘Conservatory C5’ grand piano, and a Technics digital piano. Further details can be found here. All of our instruments are regularly maintained in excellent working order by expert technicians. Dr Tim Batty was appointed Church Musician in October 2010, and has sought to broaden the musical experiences offered at Carrs Lane, both during Sunday and Wednesday services, and also by establishing a regular programme of concerts and workshops open to all. Details of these can be found on the News page. 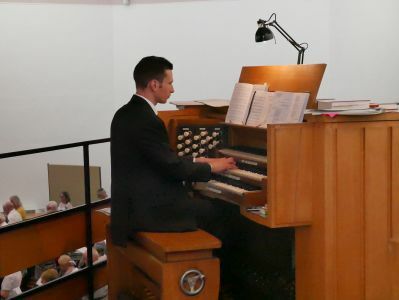 Tim has previously held a variety of posts as an organist and / or chorister, gaining experience in all the major denominations of in the UK, and was a former organ scholar at St Giles’ Cathedral, Edinburgh. His main career interests lie in science, and he has recently completed a PhD in groundwater contamination at the University of Birmingham.